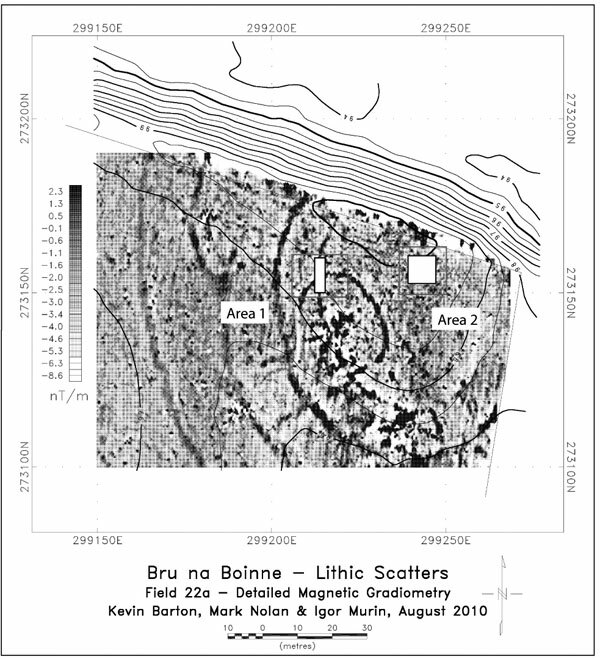 Following the surprise development in the excavation last year where it was conclusively established that the enclosures on the site are likely to be early medieval in date (and probably between 7th-11th century AD), it was decided to carry out further geophysical survey over the core area of the site on the top of the knoll within the tillage field. This was clearly a focus of activity in prehistoric times because of the extensive lithic (flint) scatter found there. It also seems to have been a focus during the early medieval period as this is the area central to all of the enclosures. Because of the lithic scatter, this area remained the best candidate area for identifying prehistoric activity. However, because of the apparent intensity of activity in the early medieval period, there is a chance that any prehistoric features that may once have existed are completely destroyed and disturbed. 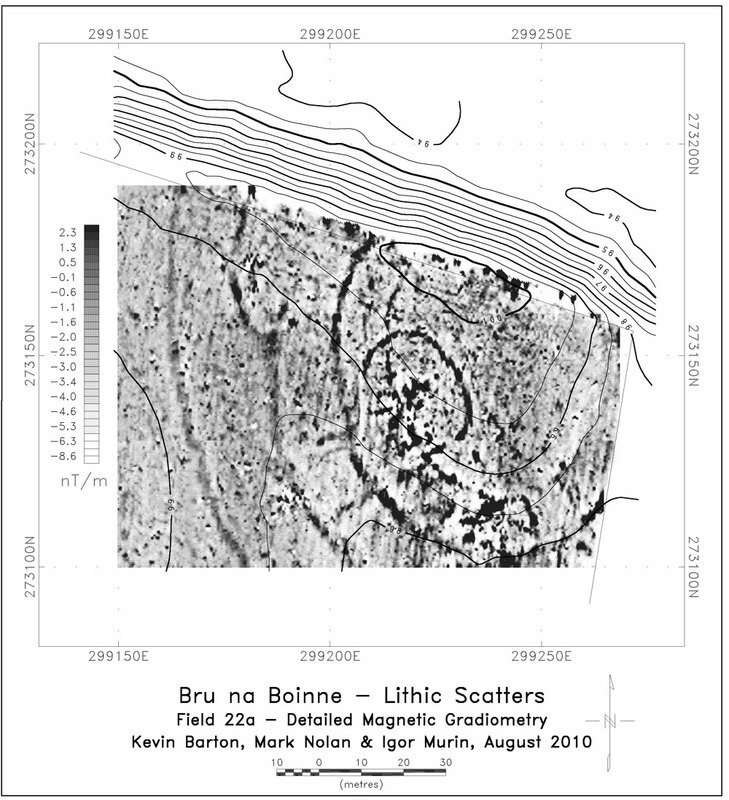 With these problems in mind, a second programme of geophysical survey was carried out in August 2010 at a higher resolution than the original geophysical surveys. The hope was to identify more clearly any features that might be earlier than the early medieval enclosures. 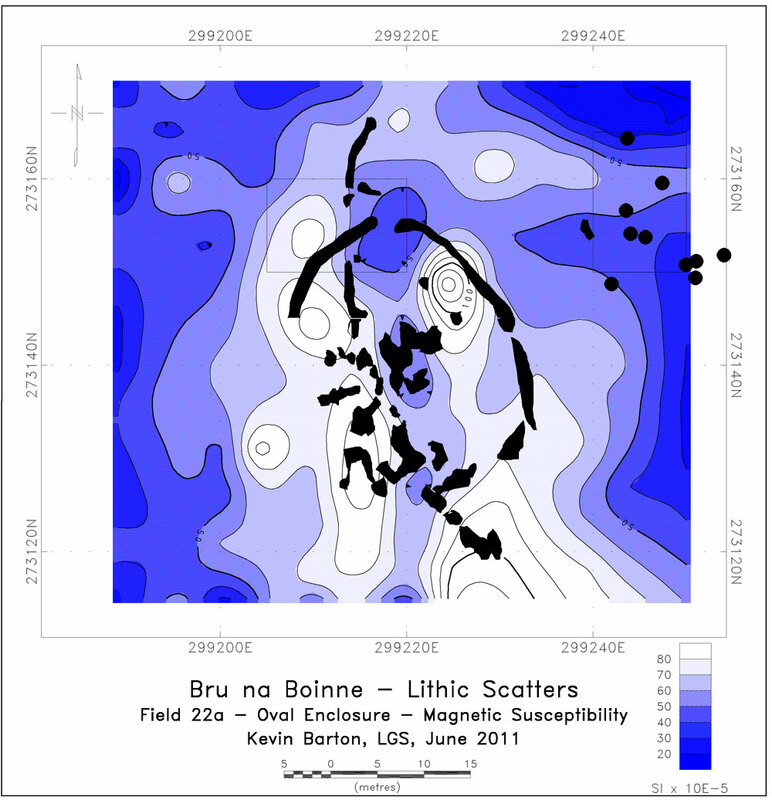 Three high resloution surveys were carried out: magnetic gradiometry (Figure 1), earth resistance (Figure 2) and magnetic susceptibility (Figure 3). See the following figures for the results of each of these. 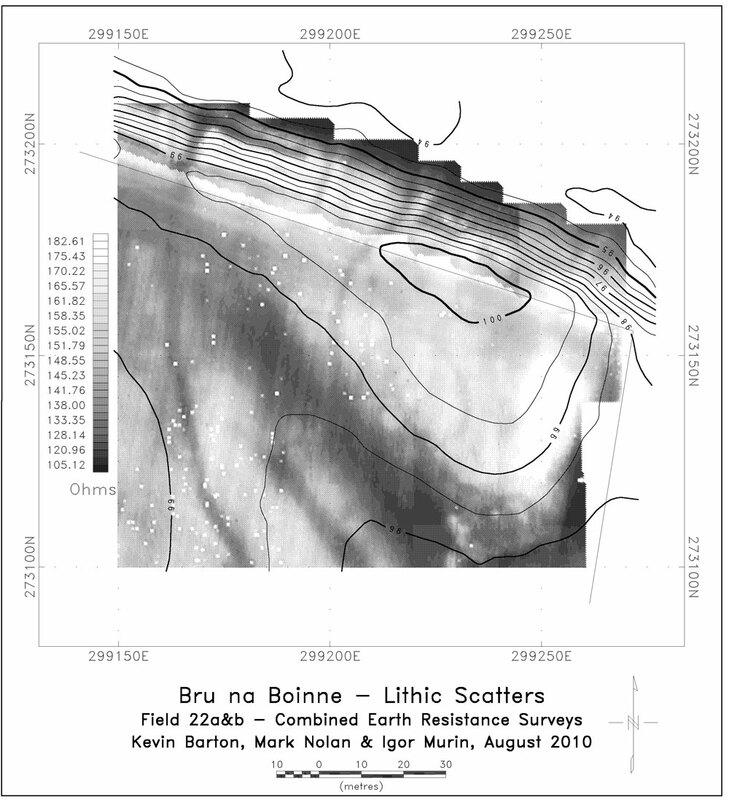 The magnetic gradiometry has shown up more detail than was apparent on the original survey. For example, the second enclosure from the outside clearly deviates from its curvilinear path as we move northwards towards the terrace slope. This may be a modification of an earlier version of the enclosure as there are hints of an earlier, less definite enclosure continuing northwards. The other feature of interest is the relationship between the inner complete oval enclosure and the D-shaped enclosure beneath it. The oval enclosure looks like it cuts through the other enclosure and thus is later in date. Furthermore, there is a difference in the quality of the magnetic response between the two features suggesting that they are constructed differently. The oval enclosure is more similar in the character of its response to the other, outer, enclosures. There seems to be a contrast between the innermost D-shaped enclosure and the rest of the enclosures, possibly suggesting different construction techniques which may be due to their being constructed at different dates. Clearly, the innermost D-shaped enclosure is earlier than the oval one. The question is how much earlier. Are we looking at a possible prehistoric enclosure? The contrast between the different enclosures noticed in the magnetic gradiometry is replicated to some degree in the earth resistance plot in Figure 2 so what we are seeing is likely to be real and reflect the real character of the features themselves. The innermost D-shaped enclosure is almost invisible on this plot, especially along its western side. At the southern end of this inner enclosure feature there is an area of high resistance with a sharp delineation between the high-resistance (light coloured in the plot above) inner area and the low resistance area immediately outside (dark coloured). The junction between the two areas appears to be particularly sharp and suggests a possible stone facing/revetment feature. The magnetic susceptibility plot shows an area where the soils have been strongly altered by activities like burning and the disposal of organic waste. It shows a clear and distinct focus of activity which seems to be contained to the west by the third enclosure from the edge. It extends a lot further to the south than the line of this ditch and continues on outside the survey area. 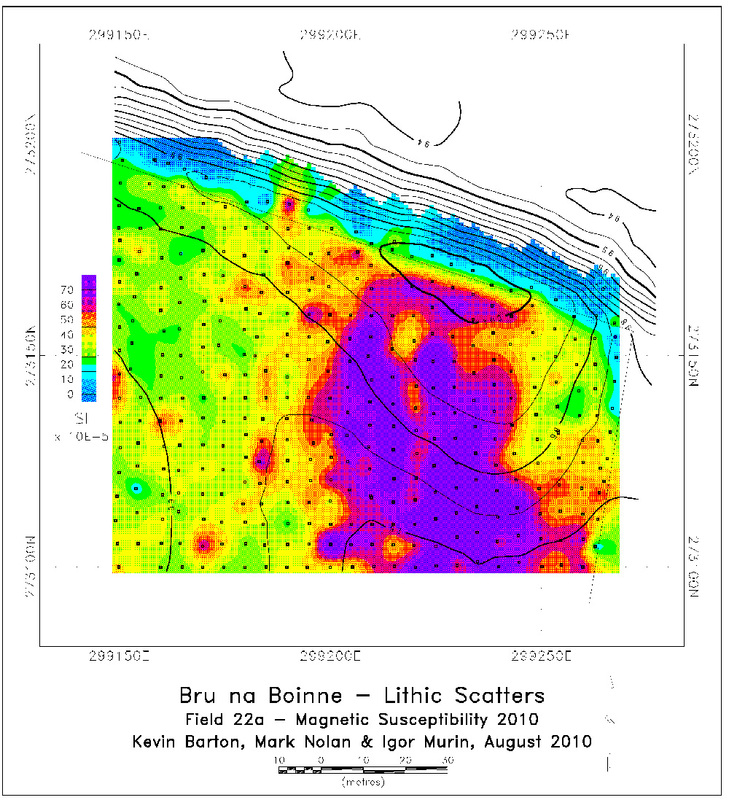 There is a band of low values running in a north-south direction through the middle of the zone of enhancement which may be due to the way the space was utilised in the past, or it may be due to sampling or post-depositional processes. There seems to be a slightly separate elongated area of enhancement running east-west along the northern boundary of the field which may be a secondary activity focus. It may be significant that this is focused on the southern side of the highest point of the topographic knoll.